This post is for the benefit of a commentor on the Daily Blog who says I am talking "nonsense". The following is a table supplied to be by MSD under the OIA. 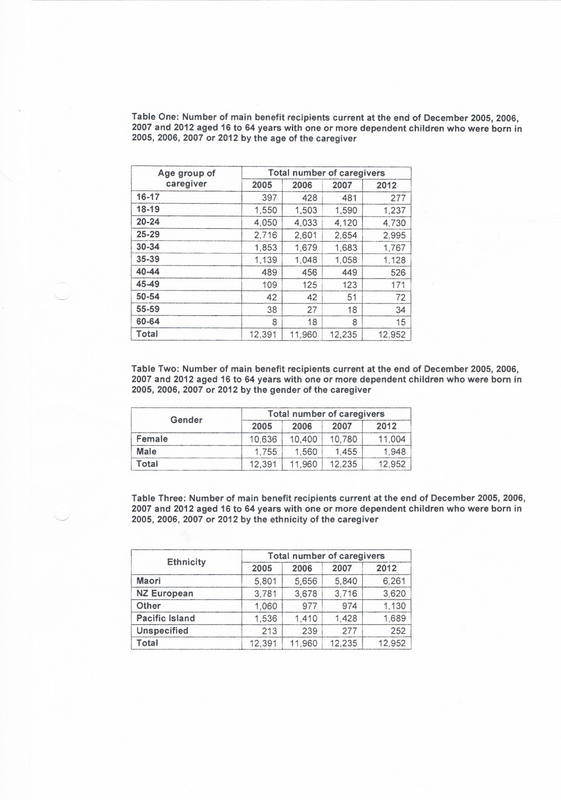 The proportion included in a benefit at birth or very soon after fell from around 25% of children born in the 1990s to 20% of children born in 2005 and 2006 and 18% of children born in 2007. Although contact with the benefit system fell, as many as one in five children turning 15 in 2008 are estimated to have been supported by a main benefit for a total of seven or more of their first 14 years of life. 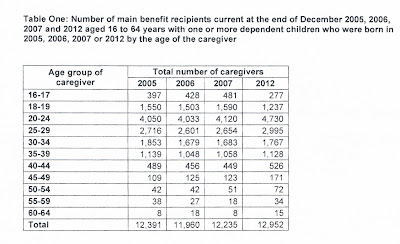 An estimated one in ten spent a total of 11 or more of their first 14 years supported by a main benefit. 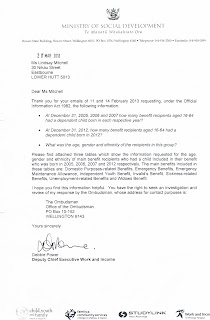 So in the year when NZ had the lowest unemployment rate in the OECD, 18 percent of children born that year were dependent on welfare by December 31. Table not enough. Here is the full OIA as requested. 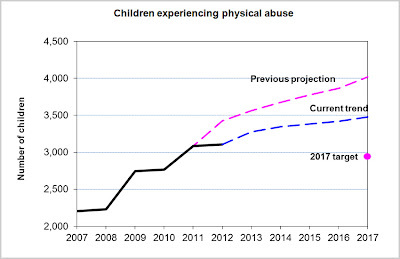 Good news on physical child abuse statistics? I was prompted to check the latest physical child abuse statistics when I heard Deborah Coddington (standing in for John Tamihere on Radio Live) say that the anti-smacking legislation is working. No disrespect to Deborah but I immediately wondered what she bases that on. 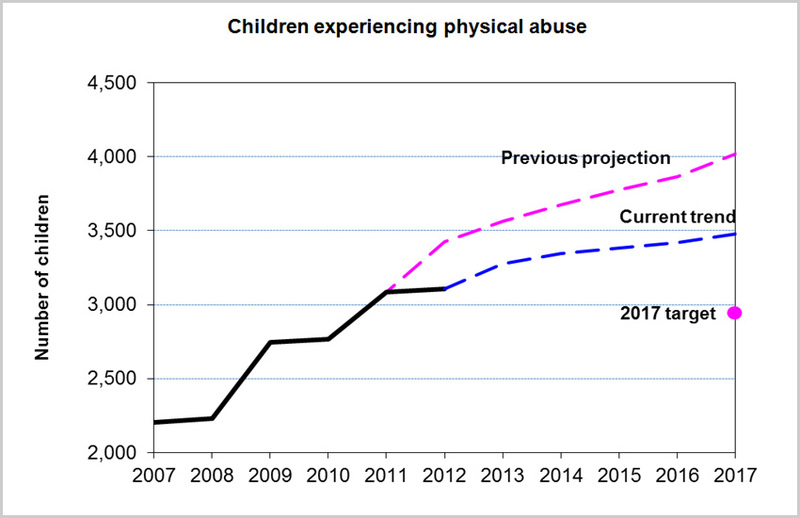 At best it could be claimed that the anti-smacking legislation has lowered the projection, but the trend it is still upward. But it raises another issue. With many of those countries (particularly the United Kingdom, where so many NZ residents were born) lifting their retirement ages, what they save, NZ will have to pay out. Foreign-born new retirees will be eligible for NZ Super at 65 but there will be no immediate offsetting equivalent from their birth country. Here's what is happening in the UK. And this is what the US is doing. It makes sense for NZ to broadly align itself with those countries is has social security arrangements with. This anomaly is yet another reason why John Key should have thought before pledging to hold the Super qualifying age down. The NZ Herald reports on the release of progress on achieving the Better Public Service targets yesterday. 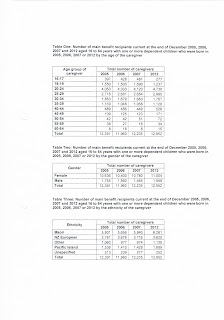 In the past year, the number of long-term beneficiaries fell from 78,212 to 75,366 - a drop of 3.6 per cent. 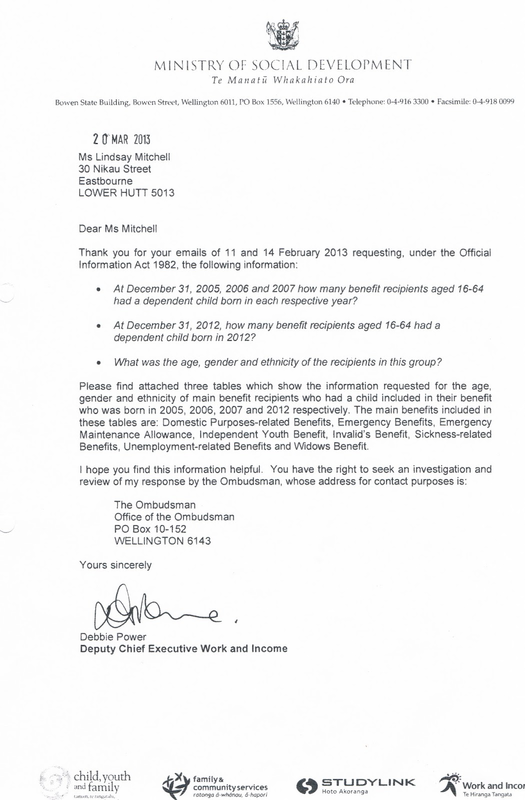 The DomPost also reports on page 2, "The number of people on a working age benefit for more than 12 months has dropped by 3,000, to 75,300." 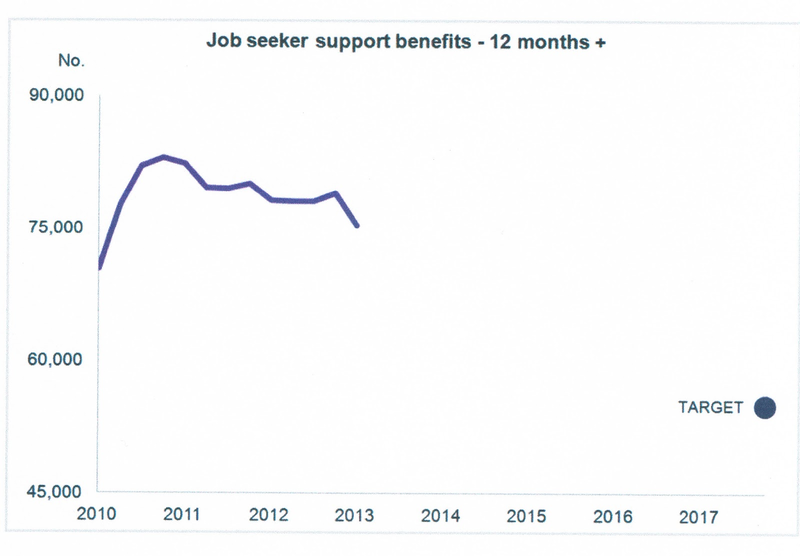 The number of working age people on benefits for more than 12 months is far higher than 78, 212. The actual number is over 230,000. 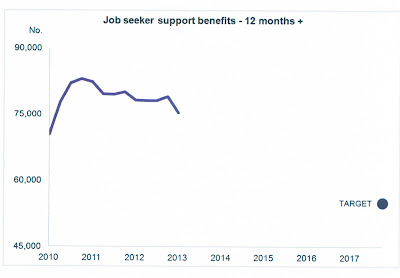 The 78,212 refers to working age people who have employment obligations.These are the people who will be moved onto the new Job Seeker benefit next week (if the reforms are running to schedule). 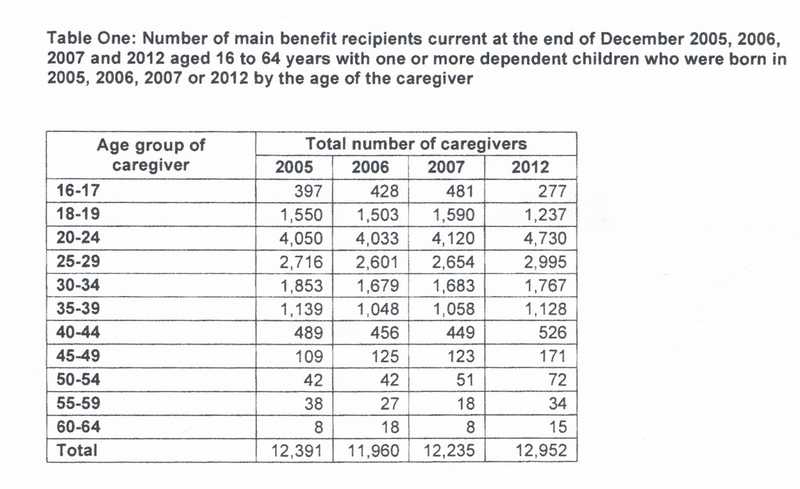 It ignores women with children younger than 14, most on the invalid benefit and some on the sickness benefit. They will move to either Sole Parent Support or Supported Living Payment. The welfare target is better explained here. As I've commented before, it's a very soft target. I have no regard for Grey Power. Do all of the grandparents who belong to this organisation agree that their grandsons (and grand daughters?) should be subject to compulsory military training because some scumbags commit crimes against the elderly and others? It's just one of those knee jerk responses that makes me groan. Why blame the vast majority of young people who live lawful and productive lives? I suppose they'll be calling for Winston First to adopt this dictatorial, authoritarian measure as policy. The worst of it is, if successful, Winston First will probably go up in the polls. Oh, and don't demand my respect based on age. Your collectivist, statist, unthinking notions preclude it. I was going to say that young fools, middle-aged fools, old fools are all the same. But the old fool is actually worse. One might have expected some modicum of wisdom and tolerance to have developed by now. The Owen Glenn Inquiry is a mess. It appears to have been dogged firstly by internal conflict, which didn't surprise, and then by the revelations of a "physical abuse" charge against a woman (in another country, 11 years ago), which Glenn denies. But it strikes me that regardless of whether the charge was based on a genuine incident or not, there have been numerous men involved in the White Ribbon campaign who admitted to violence in their past. And media have actually put these characters on a pedestal. They call them role models and agents of change. So if there were any truth to the charge it shouldn't exempt Glenn from proceeding. If there is no truth, he needs to provide a full explanation of what occurred. That's the downside of courting widespread public approval. Calls for the name of the inquiry to be changed are little more than clutching at straws. If the media is as hostile to Glenn as he believes, whenever they write about the inquiry they will simply add, "formerly known as the Owen Glenn inquiry". In hindsight, though it should have been obvious from the outset, it would have been better if Mr Glenn hadn't launched his inquiry with such fanfare, but had set up a low key behind-the-scenes operation. Even then, my response to commissions of inquiry irrespective of who funds them is the same. They are superfluous. The causes of abuse, particularly against children, are already known. I wasn't excited about the establishment of this inquiry and I'm not excited about the prospect of its demise. In a fascinating way this debacle appears to have been driven by some of the same aspects of human nature that feature in domestic abuse. Desire for control, ego, and revenge.